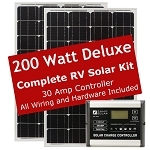 Deluxe 200 Watt RV Solar Kit with two 100 Watt Class A, Crystaline Zamp Solar Panels. 11.2 Amps per hour under optimal conditions.Still room for another panel to be installed on the 3 Port Solar Roof Cap and MORE POWER! The average boon-docking or dry camping RV’er/Camper is likely to use between 20 and 30 Amps a day. On an average summer day of 6 to 7 hours of optimal sun light. Expect to get 67 to 78 amps delivered to the battery per day. With our 200 Watt Deluxe Hardwired Solar Kit there is still one extra available solar port for adding more solar power from our Deluxe Expansion Kits. 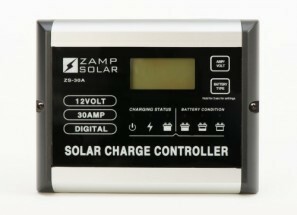 These deluxe solar kits are designed to hold a total of 450 Watts of solar power or up to 25 Amps of charging power.